The Garden Players – Children's Musical Theatre Program — Children's Musical Theatre program in Forest Hills, Queens. When kids get magic, they magic it up! Join them on their journey of discovery to reunite the magical creates of the forest and find the magic within us all. 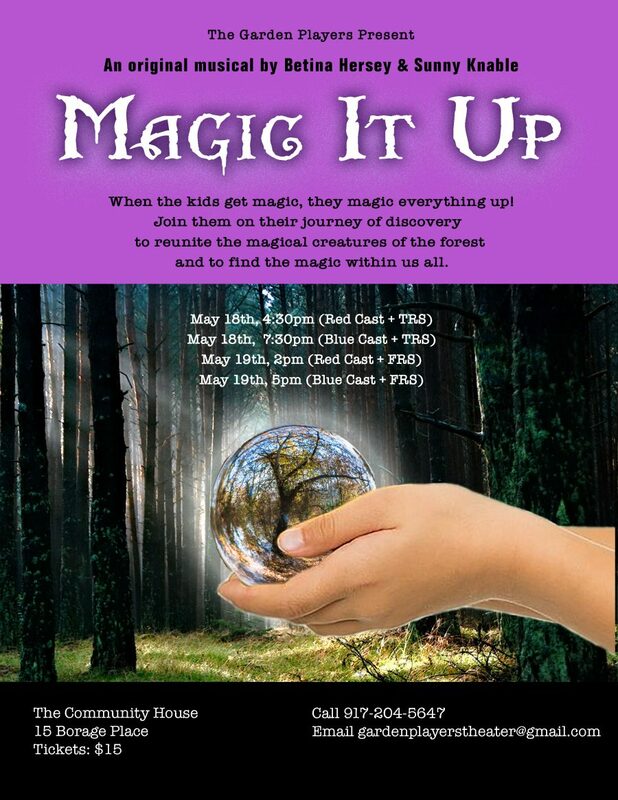 Mark your calendars because the Garden Players Kids will be performing Saturday, May 18th at 4:30pm and 7:30pm and Sunday, May 19th at 2pm and 5pm at the Community House, 15 Borage Place, Forest Hills. Tickets, $15, go on sale April 7th and can also be purchased at the door. Seats are numbered, so buy in advanced if you can, or call to reserve your seats! Actors: We have two casts for GP1, GP2, and GP3. Rising Stars is divided into 4 casts. Red Cast actors (Friday GP1 & GP2) perform at the Saturday 4:30pm and Sunday 2pm shows. Blue Cast actors (Tuesday GP1 & GP2) perform at the Saturday 7:30pm and Sunday 5pm shows. Tuesday Rising Stars actors perform in one Saturday show. Friday Rising Stars actors perform in one Sunday show. Find out your cast from Betina. The second semester begins the last week of January, but join sooner so we can get to know you before we start work on our original musical. The best time to start: Jan 4 for Friday classes and Jan 8th for Tuesday classes, to be a part of our Sunday Benefit Concert January 27th, the additional concert January 26th, and to let us get to know you before we start work on our original musical which is performed May 18th and 19th. Registration forms are available on the Downloads Page. We do not hold summer classes since we are professional performers and we go on tour during the summer with our bands Banjo Nickaru & Western Scooches (originals) with our latest album Get Us Out Of Fearland reaching #2 on the International Folk DJ Charts & Hot Jazz Jumpers (1920’s jazz) with our album favorably reviewed in Downbeat and London Times. Recent performances included Saturday January 26th as part of People’s Music Network Children’s Concert, 2pm, at Central Park East II Middle School, 443 E 100th St, New York, NY 10029 and Sunday January 27th, Garden Players Benefit Concert at The Community House, 15 Borage Place, 3pm and 5pm (1 hour concert full of music and acting improv). Proceeds go to Give A Kid A Seat at the New Victory Theater and towards our May show costumes. Our professional band included Nick Russo, Sunny Knable, Betina Hershey, and Kate DeFeo led acting improv with GP grads! Switch It Off! 2018 article in the Queens Gazette: Thanks Tony Barsamian and everyone at the Queens Gazette. Take a look at this article about our recent production Switch It Off! Congrats to our 8th grade grads headed to Performing Arts Schools! Nicole Grig attend LaGuardia H.S. of the Performing Arts as a vocal major, Rajan Worden will attend LaGuardia H.S. of the Performing Arts as a drama major, and Elliot Nieva will attend Frank Sinatra H.S. as a vocal major! Little Comb Productions put together a wonderful video showing highlights of our 2017 original musical “Your Turn! A Superhero Musical”, including little stories about the creation process from Betina Hershey (writer, director) and Sunny Knable (writer, musical director). Actor Interviews May 2017. What are the real benefits of musical theater? How do kids feel about themselves when they put on a show? Sara of Little Comb Productions interviewed some of the Garden Players actors. Here is what they have to say. Queens Gazette published an article written by our Garden Players grad Stella DiCicco about our latest show this May 2017, Your Turn, A Superhero Musical! We were also in the September 17th Queens Gazette with photos from Lemontales and an article by director Betina Herhsey. Broadway World features our Garden Players with photos of our production of Space Pirates! Nicolette Barsamian, a Garden Players grad, and now a writer for the Queens Gazette interviewed Garden Players Director Betina Hershey. A more than 80 years staple of the Forest Hills Community, this childrens musical theater program started out as a renowned community theater group. As a children’s musical theater, the Garden Players has been under the direction of Betina Hershey since 2002. An innovative program geared towards encouraging expression, creativity and individuality, children will learn singing and acting and improvisation techniques using Viola Spolin Theater Games, improvisation leading towards a long form Harold, ear-training, and studying of both classic and original musical theater material. Emphasis is on fun, trust, focus and courage. At the end of the school year, participants will perform in a fully staged, choreographed, costumed original production accompanied by professional musicians at the Community House to an audience of up to 240 per show. Six of our original musicals have been published and performed by hundreds of theater groups all over the world. Current Students & Alumni of the Garden Players have attained high levels of achievement, including: appearing in an Adele commercial during the Grammy Awards, singing the national anthem at the US Open, winning prestigious vocal competitions, being accepted into Professional Performing Arts School, Fiorello H. La Guardia High School of the Performing Arts, Frank Sinatra High School, Talent Unlimited, Mark Twain, appearing on Saturday Night Live and more. Congrats!